Strengthening existing roof rafters is a difficult process that often requires professional help. If you have a stick frame roof, there are a few basic techniques that you can use to strengthen your rafters. 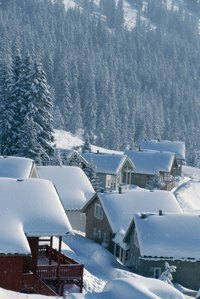 Snow increases the overall weight of your roof, adding to the forces acting on your rafters. Increasing the thickness of your rafters increases your rafters' ability to withstand sagging. Reinforcing the connections between the rafters and the walls will help prevent your roof from collapsing. Measure the thickness, width and length of the rafters in your home and purchase one piece of framing lumber of the same size for every two rafters in your attic. Measure and cut each piece of framing lumber into two boards measuring one-third and two-thirds the length of your rafters. Carry the cut lumber and framing supplies into the attic. Place a long piece of framing lumber alongside the rafter so that the narrow edge is flush with the underside of the roof deck and the bottom reaches the ceiling joists. Drive a nail into either end to hold the board in place. Place a short piece of framing lumber against the rafter above it so that the two boards form a continuous line. Fasten the framing lumber to the rafter using nails driven through the lumber and into the rafter. Use at least 8 nails to secure the framing lumber to the rafter at both ends. Use nails that are long enough to completely penetrate the framing board and at least half the thickness of the rafter behind it. Repeat this process for the rafter on the opposite side of the roof and every other pair of rafters in your attic until half of the rafters in your attic are reinforced. Make sure that each piece of framing lumber is flush with the roof deck above it. Locate the places where the ceiling joists in your attic meet the rafters. Drive additional nails through each rafter and into the adjacent ceiling joist. Avoid driving nails within an inch of each other or an inch of the board's edge to prevent cracking or splintering the wood. Cut a piece of plywood 4 inches wide and a foot long for each rafter you reinforced. Place a cut piece of plywood over the place where the two sister beams meet and fasten it to each beam with nails. Repeat this step for each reinforced beam. The number of nails that you use to connect the framing lumber to the rafters directly impacts the amount of strength they add to your roof. Adding a bead of wood glue between the framing lumber and the roof deck ensures they are in close contact and increases your roof's resistance to strong winds. Reinforcing your rafters does not increase the load bearing capacity of the walls supporting your roof. Before you reinforce your rafters, consult a professional engineer to determine the best method for strengthening your roof.